Have you ever seen a goalie's mask and thought, "Hey, I could come up with something way cooler than that," I know I have. Well, now's your chance. 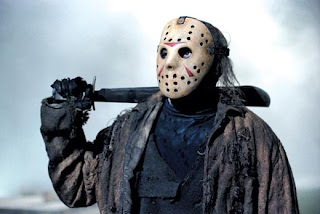 Michael over at Collecting for Kicks is putting on a goalie mask design contest. The deadline is August 13th so head over there and get signed up before its too late and show off your artistic ability. I've seen some contests like this in the past, most notably for Curtis Sanford's Canucks mask a few years ago, but this is the first time I'll be participating. I just put the finishing touches on my design, now I'm really looking forward to see what others come up with. Lately I've focused on adding to my Jimmy Howard collection as I find player collecting a lot more satisfying than set collecting, primarily because of the variety a player collection provides. It's a lot more fun to be on the lookout for new cards as new releases come throughout the year. 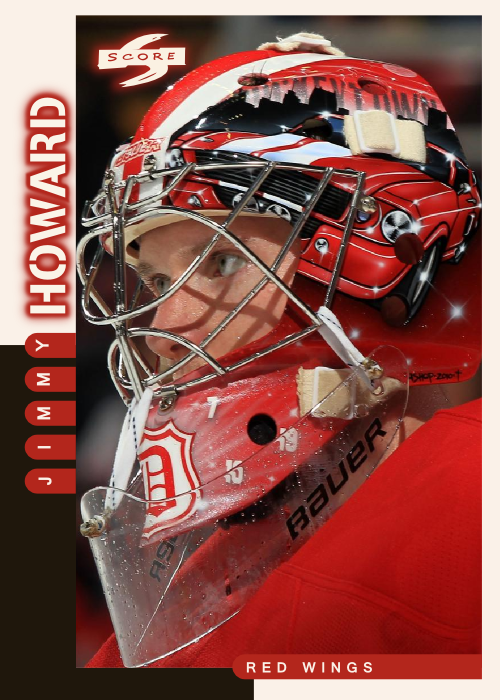 Part of that new focus has led me to creating a separate webpage dedicated to my Jimmy Howard collection, appropriately titled "The Jimmy Howard Collection." It's a place for me to keep and up to date inventory of the collection, as well as want and trade lists. Most importantly, I'm using it to display the collection, with front and back scans for each card. Check it out by clicking on the screenshot above for the link. Let me know what you think, and if you have any comments or suggestions, as this was my first attempt at creating a basic collection website. Edit: This site has since been deactivated in favor of a new and improved PC website. If there's one thing I like about Blogger above all else, it's the freedom that we are given as bloggers to customize our blogs. That being said, you have probably noticed by now that I made some changes around here. I've wanted to completely overhaul the design here for a while, but it's been a long and drawn out process of trial and error. I've finally settled on something I like that gives the blog a cleaner and simpler look. When I say long and drawn out, I mean it. I went as far as setting up a 'dummy' blog just to play around with the various templates until I found something that works. And that wasn't just recently, I've been slowly hacking away at this for months now in my spare time. The beauty of doing that was never having to worry about permanently messing up the live template, as it was from the old designer and I would have no way to recreate it. In reality, since I started this thing back in 2009, the design's been a slow-moving work in progress. Most of that has to do with my inability to keep things the same for a long period of time. I've made a lot of slight changes over time (i.e. banner, background, etc. ), but never a complete overhaul involving an entirely new template. As far as getting everything to where it is now, let's just say I had to learn more than I've ever cared to about HTML code through trial and error, as you can see this isn't your cookie-cutter template from Blogger anymore. At times it definitely got to be pretty frustrating, but eventually everything worked out for the best. Let's take a look at what I actually did to change things around here. New Header: It looks just like the old one but I changed up the cards in the background of it. Notice it's got a three-tier setup with my Howard cards on top, MVP Stanley Cup Edition cards in the middle, and Metal Universe cards on the bottom. I thought that would be a neat way to incorporate my PC projects. Tabs: I've had the standalone pages on here all along, but always docked on the sidebar. I wanted them to be more visible so I moved the tabs bar just below the header, which was a real pain when it came to getting the format right. PC Project Trackers: Before I had the Super and Gold Script trackers and that worked, but now that I've got three main projects, I wanted an overall tracker for each project. The pictures are just a way to visualize my three projects (any hockey regulars on SCF should recognize the Howard banner). Blog Lists: I though it was a good idea to group the blogs I read this way so I didn't end up having one blog list with 50 or so different blogs to keep track of. At this point there are still several things I want to add/update. 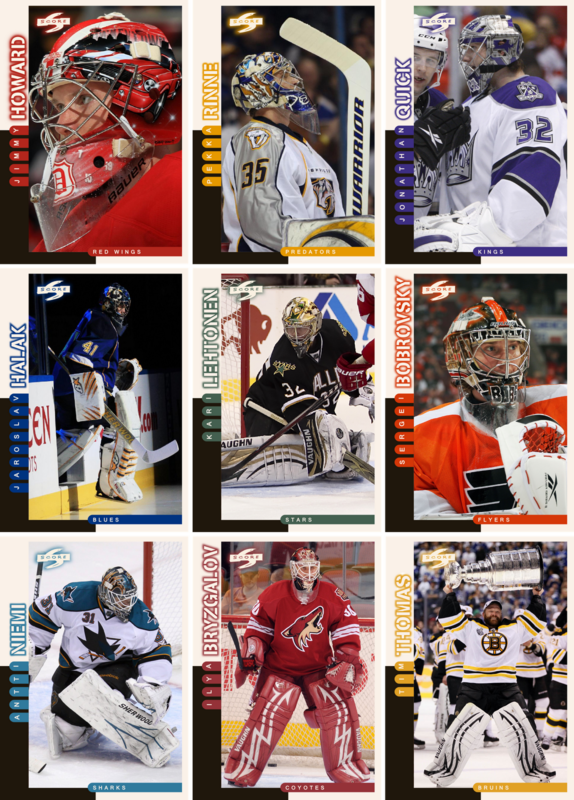 Those would be adding some more highlights of my hockey collection (not just cards), a simple Inkscape tutorial, and an updated want and trade list page. Look for those things to be up and running soon. Overall the look is still pretty much the same, just a little cleaner. I like it a lot more than what I've had in the past. What do you guys think? Also, for those of you using Blogger, do you like to customize your blog? Or do you like the templates provided by blogger. Obviously, I like to change things up a bit. Finally, I have one favor to ask of anyone using IE to view this page. Let me know if the tabs are messed up on the right-hand side, because I happened to be on IE the other day and noticed the Want/Trade List tab was kind of bunched up at the right end of the page. What I don't understand is why it works fine in Chrome, but not IE. Any info on the problem or solution would be greatly appreciated. Edit: Ok, now I'm really stuck on this one. I have no clue how to get the format to work correctly on IE. Upon closer review, it seems like the overall width of the blog is different between browsers. Is there anyone out there who knows how/why I have this this issue and how to fix it? Edit (Pt 2): If you're reading this now, I ended up changing the tabs back into the list on the sidebar again. The only difference now is I created them with Inkscape using the same text as the header. I've always said these picks can be anything from a super high-end card to a worthless piece of cardboard from the junk wax era. This one falls somewhere in between and is just another one of those cards that caught my eye when looking through my collection. It's a 3 Star Selection from 1996-97 UD Collector's Choice. I think if you're going to pick three players to feature as the three stars, you can't go wrong with these three. 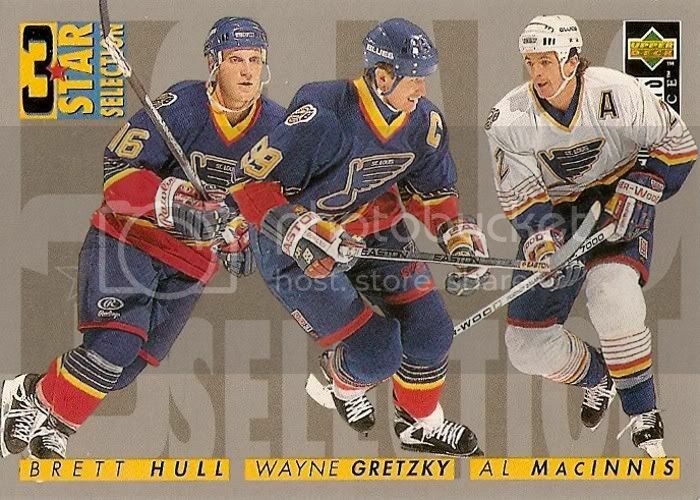 It's still kind of weird seeing Gretzky with the Blues, but that's where I'll always remember him best after giving the puck up to Steve Yzerman just before his Game 7 overtime goal back 1996. 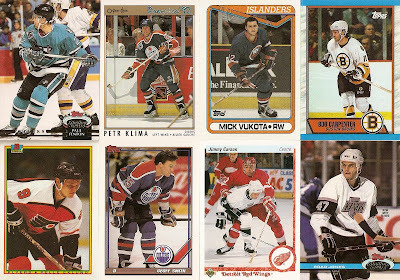 I distinctly remember loving these cards when I was just getting into collecting in the mid-90's. Back then the idea of autographs and jersey cards was non-existent, so all I had to get excited about were inserts/parallels/subset cards like this. I guess I just thought it was cool that a card featured three different players when most cards did not. I still have this and a few more in my collection somewhere. I think there was one made for each team, but I could be wrong. BTW, what do you guys think of the new layout here? Lately I've been wanting to do another custom card set, but never really got around to starting anything, until yesterday. Instead of working on my second page of 'Fractal Mask' cards, I thought I would change things up and do another recreation set. This time around the set I recreated is a bit newer compared to the others I've done in the past. As the title says, this time I used the 97-98 Score as the basis for my design. I got the idea after looking at my TTM successes and realizing quite a few came from this set. 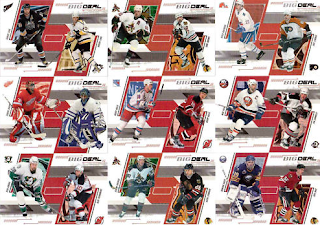 Brett over at My Hockey Card Obsession put together an excellent look at this set back in October of 2009 as part of his 'One Sheet, One Set' project. Head over there to check it out and get a good idea of what the original set design looks like. Looking at the design, it's made up of primarily simple geometric elements, so I thought it would be a quick project. Here's a look at the first one I came up with, which took maybe an hour including time to find and install a font that matched the vertical player name text. These came out much better than I thought they would. The hardest part was figuring out a way to consistently match the glowing font for the player's last name. Other than that, it was as simple as tracing the various geometric shapes, layering them properly, and assembling them into the finished product. If you're wondering why I chose the player selection I did, it's because I wanted to get as many different team colors represented as I could within the nine card limit. 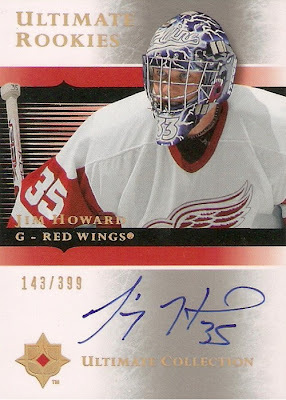 My favorite of the bunch is definitely the Howard, as it's got an excellent closeup of his best mask to date. Beyond that, I tried to get a variety of pictures (i.e. Thomas hoisting the Cup and Halak stepping onto the ice). I wanted something more than simple action shots. What do you guys think, did they turn out ok? It's been kind of slow around here with a lack of pickups lately. Add to that the nice weather and starting up another roller hockey season last week, I just haven't had the time or motivation to post anything. So, I thought it was a good time for another one of my picks. This one comes from the Big Deal subset that was part of 2002-03 BAP Memorabilia. This set featured trades and free agent signings both from past and present (at the time). 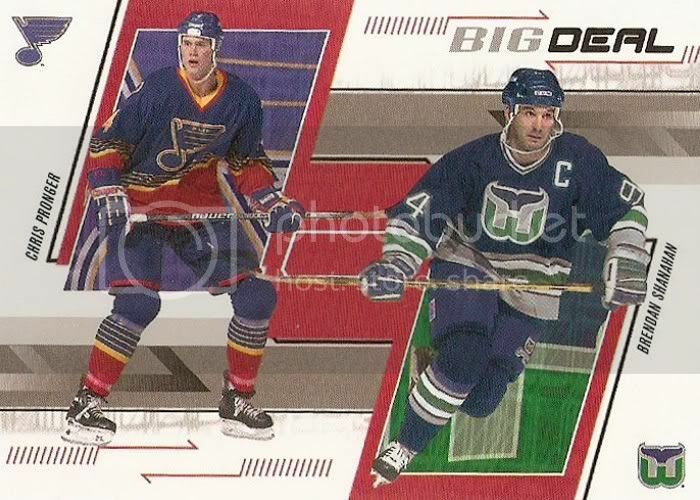 This one in particular features the trade between Hartford and St. Louis that saw Brendan Shanahan and Chris Pronger swapping sweaters in July of 1995. I love the idea for this set and the design even more. I like how each player takes up almost half of the the card and the team logos are nicely displayed right behind them as well as in opposite corners. As you can see, there are a lot of trades there, but some significant free agent signings are included as well (i.e. Curtis Joseph, Bobby Holik, etc). I'll have to find the checklist for this set though, as I don't know exactly how many there are. So what do you guys think about this set? Since I've been actively collecting Jimmy Howard, I've only come across one pickup that I would consider a real steal, and that was the Black Diamond 1/1 that only set me back $40. Well, I think I found myself another so-called steal thanks to the wonderful world of ebay. It's an Ultimate Rookies auto from 2005-06 UD Ultimate Collection numbered 143/399. Why do I consider this to be another steal? I won the auction for $13 plus $2 for shipping. Maybe that doesn't seem like all that much, until I look at the BIN prices. I found three that were BIN for $79.99 and another at $50. I'd say $15 delivered was a pretty good deal. Another plus with this one is that it's hard-signed like the last one I picked up, and unlike the GoalieGraph from ITG and the Certified Mirror Gold from Panini. I guess I just like knowing that Jimmy actually handled this card and not just a sheet of stickers. Now, my next question is whether or not I should consider this to be an actual RC as far as organizing my PC. Right now I've got it broken up into Rookies, Base, Inserts / Parallels, and Autos / Memorabilia. I think this card is an official rookie card, but I would lean toward putting it with the Auto / Memorabilia stack I have going. It's been a few weeks now since I've been able to post another one of my picks. This one is another one that just happened to catch my eye as I was sorting through another random stack of cards. It's another plain old base card, this time former Edmonton Oiler David Oliver, although you can barely tell with the bronze foil, from 1995-96 Upper Deck. I really love the photo on this one. 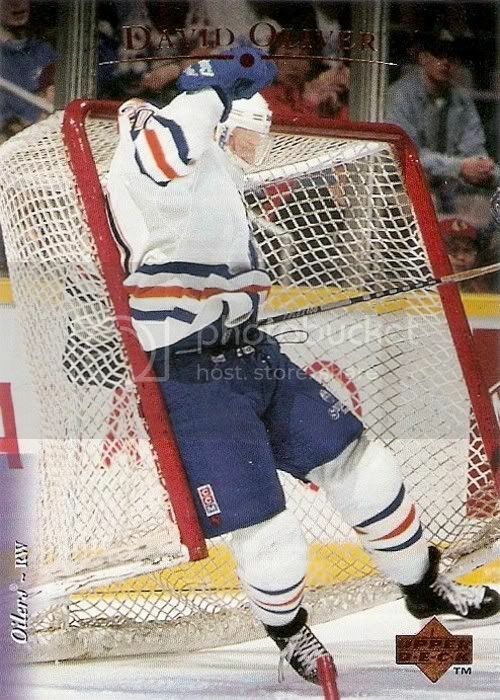 It's not everyday you see a player crashing the net like this on the front of a card. It's cool how it captures the net in midair and how you can see one of the pegs sticking out of the ice. This one is about as simple as you can get with a base card design. 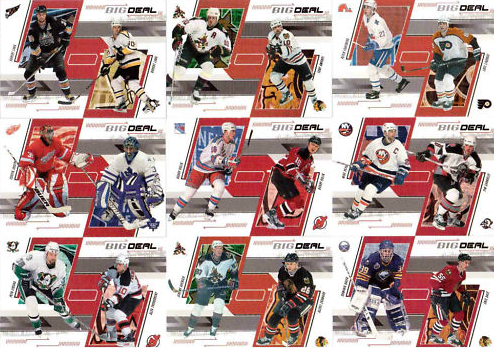 All it has is the player name on top, their team and position over a faded team-color bar on the lower left and the old UD logo, also in bronze foil, on the lower right. Among all the things UD seems to do wrong, photography is something they always excel at with their flagship set every year. This one is just another example of that fact. The awesome prize pack I received from Casey over at Drop The Gloves! contained one pretty important card for my Jimmy Howard collection, an 05-06 MVP rookie card. As much as I love this card as a player collector, this is another one of the MVP sets I didn't really care for. The design on the front is overly complicated with the fake wood grain texture, the fading toward the bottom, and the ugly MVP logo. I also wish they would've just left the facsimile auto completely off rather than using cursive text. This one get me one step closer to completing a rainbow in my Howard collection, now all I need is a nearly impossible to find MVP platinum parallel numbered to 25. Winning! It's awesome, especially when there are prizes involved. I have to give a huge thanks to Casey over at Drop The Gloves!, first for putting on a great contest that had me keeping a close eye on the Bruins all playoffs long, and second for the awesome prize pack he put together for me. Here's a look at what was inside. First there were three Contenders from Panini. I really like these cards for some reason. The Lindsay is awesome, I've always like the Champs set and you can't go wrong with Stevie Y. Then there were these three. The last one was a huge surprise to me. What's better than a Steve Yzerman OPC rookie for a Red Wing collector like me? 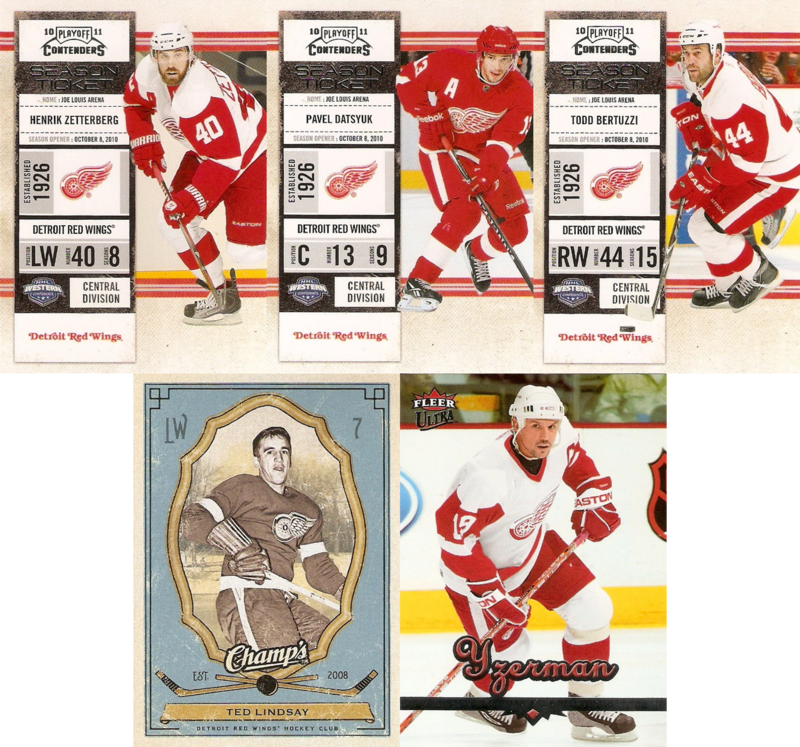 This is easily my new favorite non-Jimmy Howard Red Wings card. Thanks again Casey! There was one other card, but I'll save that for another post. This kind of makes me want to put on some kind of contest here at Card Boarded, I just have no idea what I would do for it. And the rest (well, most of them). I tried to get a scan of every different set included and got all but one, which was 90-91 Score and I'm sure we all know what that looks like. All in all, there was a nice mix of cards for only $0.50. These next four cards were the last purchase I made at the Gibraltar show last weekend. I spent a ltttle more on these four than the other two purchases, but it was worth it, especially for the last card. The first was this In Action insert from 2010-11 OPC. This next one is also from OPC, its a retro rainbow parallel. 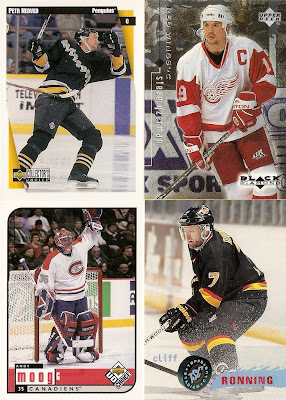 Onto one more insert, this time from 2010-11 Playoff Contenders. Now, for the best card I was able to find at the show, for a decent price too. It's an Ultimate Signatures from 2005-06 UD Ultimate Collection. What I like most about this one is the fact that it's hard-signed, meaning Jimmy actually handled this card himself, something I cannot say about any of my other Howard autos. That's it for now, although I've got one more recent addition to the collection to share once I have it scanned and ready to go.